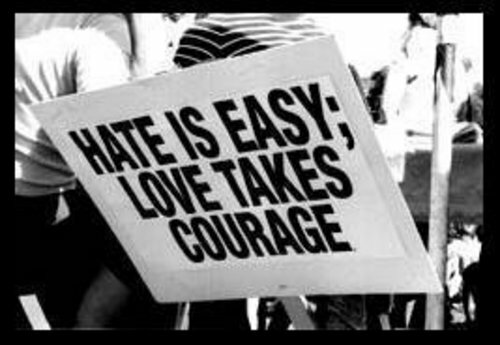 Hate is such an extreme and intensely hostile word……..and yet everyone who’s seen or felt it knows it’s real, in some way at least. Hate destroys……..
On the other hand, love gives hope, it’s not only something that you feel, it’s something that you do. I would love to say I choose love every time. But honesty demands that I am not always so self-aware. There’s little enough capacity for hate in me now. My emotional pique rarely expands further than anger. But I’ll still get caught there, and find myself acting on it, like I did last night in a conversation, trying to bring some insight to a friend of a friend, but a well-meaning gift could not be taken as such and, after a couple attempts to create understanding, I responded to hostility in kind. Mmmm… and from that conversation sprang The Crucible of Suffering: Pain. I had to feel my own anger, and beneath it my own fear, and beneath that my own pain to understand why, in that moment, I could not choose love. I could not even choose to walk away. I chose, instead, anger.